Shot on location on Harbour Island in the Bahamas and Pietrasanta in Italy, as well as on Block Island, Rhode Island, Block Island Artists presents the intimate portraits of two internationally renowned artists – abstract painter Ben Wohlberg and stone sculptor Sean Hartnett. From their studios in the Bahamas or Italy, they come home to Block Island to each demonstrate his craft, share his inspiration, and guide viewers through the painstaking creative process from blank canvas or stone block, to breathtaking finished works. Block Island Artists premieres on Rhode Island PBS (digital 36.1) on Thursday, June 29 at 8:00 PM, as part of the ongoing local film series, Rhode Island Stories. In an accidental spill of white roof paint onto a canvas, the universe revealed to artist Ben Wohlberg what has since become his signature style, one he remakes uniquely his own every day. 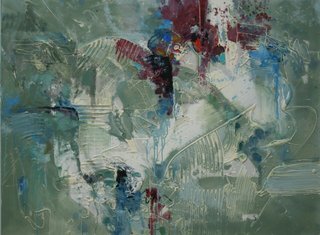 Using a technique he calls underpainting, Wohlberg creates texture, dimension, and terrain with spontaneous expansive gestures, intuitive strokes, and deliberate, blunt scrapings, building channels for interplay of light and shadow, color and design. Born in 1927 on a farm in Montezuma, Kansas, Ben Wohlberg’s first “canvas” was the dirt, in which he began to draw at age 5. After serving in the Navy during World War II, he earned a B.F.A. in illustration and painting from Art Center School in Los Angeles, California. With dreams of becoming an artist, Wohlberg was encouraged by his father to instead pursue a career in which he could support himself. Convinced he could combine the two - earn a living creating art - Wohlberg moved to New York City in 1953. Indeed, he supported himself and his family as an advertising illustrator at Charles E. Cooper Studio, and later on his own designing commissioned magazine illustrations. 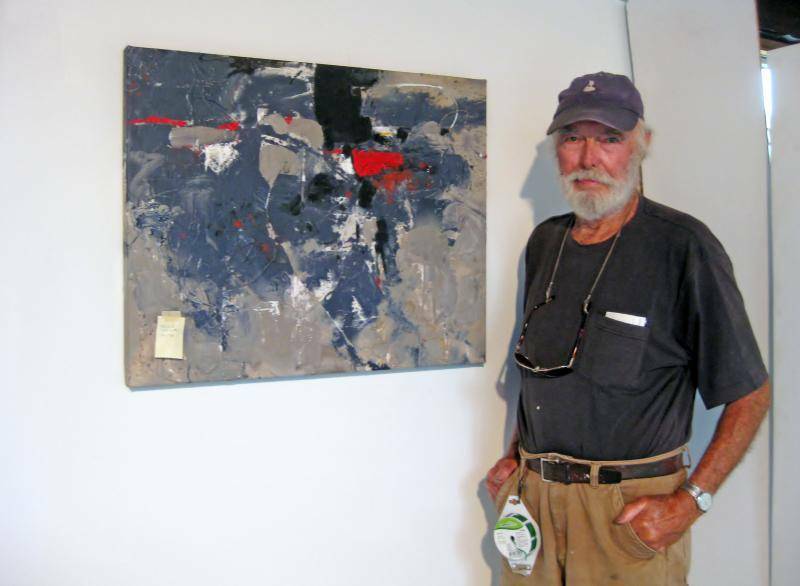 In 2005, he retired from commercial art and portraiture to pursue abstract painting full time, dividing his time between Harbour Island in the Bahamas, and a home on Block Island. To this day, his passion for abstract painting continues. Inspired by nature, Wohlberg’s paintings have been shown in galleries in New York, Connecticut, and Rhode Island, and can be found in corporate and private collections throughout Europe, the Bahamas, and the United States. From inspiration, to choosing marble, to artistic completion, Sean Hartnett’s process is an organic one, different each and every time. Born in rural upstate New York in 1941, sculptor Sean Hartnett graduated from Stanford University in 1964 and did graduate studies at Columbia University and the University of Perugia in Italy. He studied sculpture at the Woodstock School of Art in Woodstock, NY. Along with Roman sculptor, Raffaele Martini, they established the Woodstock bronze foundry. 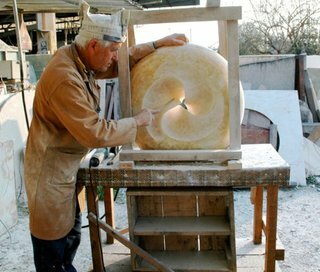 In 1970, Hartnett moved to Pietrasanta, Italy, near the marble quarries once frequented by Michelangelo. Hartnett has maintained a studio there to this day, and since 1987, he has divided his time between Italy and his home and studio on Block Island, Rhode Island. Sean has shown his work extensively in Europe and the United States, and his sculptures are included in collections on both continents. Husband and wife team Joe and Tricia Wiedenmayer, also of Block Island, capture the artists in their elements, letting them tell their stories in their own words, unfettered by narration or artificial effects. The result is two blended stories as unique as the artists themselves, and as universally inspiring as creating masterful art can be. After its debut on June 29, Block Island Artists will encore on Saturday, July 1 at noon and 11 p.m., and Sunday July 2 at 7 p.m. It will also air on WSBE Learn (digital 36.2) on Saturday, July 1 at 2 p.m., Tuesday, July 4 at 8 p.m., and Thursday, July 6 at midnight. WSBE Rhode Island PBS transmits standard-definition (SD) and high-definition (HD) content over the air on digital 36.1; on Rhode Island cable services: Cox 08 / 1008HD, Verizon FiOS 08 / 508HD, Full Channel 08; on Massachusetts cable services: Comcast 819HD, Verizon 18 / 518HD; on satellite: DirecTV 36 / 3128HD, Dish Network 36. WSBE Learn transmits standard-definition (SD) content over the air on digital 36.2; on cable: Cox 808, Verizon 478, Full Channel 89, Comcast 294 or 312.